Are there other ways you'd like to volunteer? Thank you for your interest in volunteering on behalf of San Bruno Mountain! We will contact you shortly. Please visit our events page to see a listing of upcoming volunteer program opportunities. Volunteering with San Bruno Mountain Watch is an ideal opportunity to venture outdoors, get intimately involved with native ecosystems, and help protect the beautiful biodiversity of San Bruno Mountain. It's also a great way to meet communities of people dedicated to caring for and learning about our local environment. We host ongoing volunteer opportunities dedicated to the restoration of San Bruno Mountain's remarkable environment. 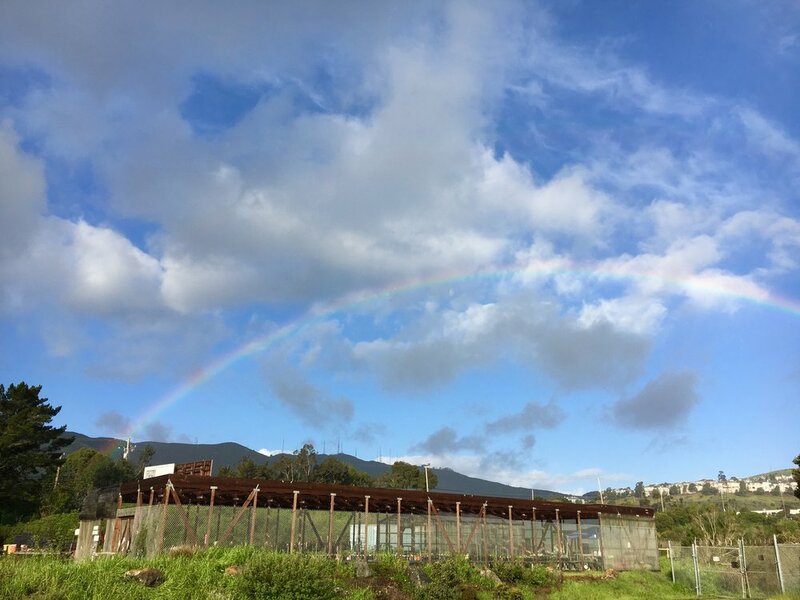 If you’d like to get involved in restoration work on the mountain or at the Mission Blue Nursery please click on the "volunteer sign up" button above. You may also email Ariel Cherbowsky Corkidi, our Program Director, at ariel@ mountainwatch.org or call our office at 415 467 6631. Please bring sun protection, sturdy shoes, a reusable water bottle, and dress in layers. We provide delicious and healthy snacks for a refreshing picnic rest during our all of our volunteer events. Below are descriptions of our volunteer opportunities. Please check our Events page for updated scheduling. Volunteers are welcome Saturdays from 10am to 1pm for enjoyable and educational ecological restoration events. Please check the Events page for a description of the restoration activity and directions to the meeting location. Volunteers planting nectar plants to nourish the Mission Blue and Callippe Silverspot butterflies. Stewardship Mountaineers work all over San Bruno Mountain to help protect and improve prairies, creeks, wetlands, and woodlands. Volunteers enhance the habitats of the mountain's endangered butterflies and tend its diverse vegetation types by removing invasive species or planting native plants supplied by the Mission Blue Nursery. Dune Defenders protect San Bruno Mountain's ancient sand dunes. Volunteers support the unique plants that find refuge on the dunes, including the rare and endangered San Francisco Lessingia (Lessingia germanorum), by pulling weeds that smother the dunes' important ecological processes. Removal of invasive ice plant uncovers suitable sandy habitat for the native dune flora. Volunteers at the Mission Blue Nursery. Volunteers are welcome to join us every Wednesday from 10am to 12:30pm at the Mission Blue Nursery. Activities vary depending on the season, but may include processing and sowing seeds collected from the mountain, transplanting seedlings, and tending to our native plant demonstration garden. Email ariel@ mountainwatch.org or call 415 467 6631 for more information. For directions to the Mission Blue Nursery, click here. Watch a video about our work in Guadalupe Valley. Tucked behind a parking lot in Guadalupe Valley's Crocker Industrial Park is a small stream and wetland that has been lovingly restored by volunteers. The valley was once a mix of grassland and wetland, drained by multiple tributaries that fed into a salt marsh mingling with the San Francisco Bay. A joint project with the City of Brisbane, this gem is also a Pacific chorus frog habitat, ringing with delightful "ribbits"! In addition to this urban stream, volunteers tend the San Bruno Mountain Civic Garden, planted at Brisbane City Hall (outside of the Police Department) in 2018. Guadalupe Valley Stewards meet on Tuesdays from 10:00 AM 12:00 PM to plant native vegetation and remove invasive plants. Check our events page to see upcoming opportunities. Blooming prairies vibrantly color the mountain's south side. South San Francisco Weed Warriors protect sensitive butterfly habitat from detrimental invasive plants on the grassy south slopes of San Bruno Mountain. The sweeping prairies are prime habitat for both the endangered Mission Blue and Callippe Silverspot butterflies. The two consecutive workdays are the last Friday of the month and the Saturday immediately after, from 9:00 AM until 12:00PM. Please check our events page to confirm workday dates. Chuck & Loretta will provide meeting locations and details to those who register. Youth under 15 yrs old must be accompanied by an adult.